Vancouver Metblogs » Hasta la vista, Churrolicious! Sadly, Churrolicious restaurant is now closed. The note in the window says it’s moving, but doesn’t have a new location yet. Here’s a photo retrospective. I feel personally responsible. 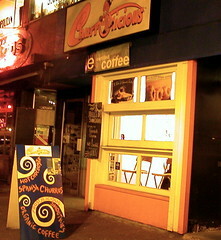 I left town for a week and without me to buy churros, the entire churro sector here in Kits must have suffered awfully. Hang in there, Hola Churro! I’m bowing my head for a moment of churro silence.